Matte finish with glossy elements! Montreal Pocket Folder Printing, also known as Presentation folders. Printed on a sturdy 14 point stock using a four color or "full color" process. Print text, photographs & illustrations. 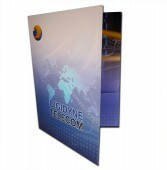 Handing clients or prospects a well designed and printed pocket folder displays credibility. It offers organization of your marketing collateral and properly displays the products and/or services your company provides in an easy and pleasant to read manner. Capture your corporate identity on a well printed pocket folder or presentation folder and show the type of business you are looking for, corporate message, educational information or how your company can solve clients and prospects challenges! Order Online Today From Montreal Printing!